We must be very careful not to assign to this deliverance the attributes of a victory. Wars are not won by evacuations. The most popular movement from Edward Elgar’s Enigma Variations is undoubtedly the ninth which is more commonly known by its unconventional title Nimrod. This movement is performed on Remembrance Sunday before the Cenotaph to commemorate “THE GLORIOUS DEAD,” those selfless soldiers who paid the supreme sacrifice for their sovereign and country. Considered a pejorative in modern usage, the nickname Nimrod was bestowed by Elgar on his only German friend portrayed in the Enigma Variations, August Jaeger. In the book of Genesis, Nimrod is described as “a mighty hunter,” and the German name Jäger (respelled in English as Jaeger) means “hunter.” Jaeger was on the hunt for masterpieces when he discovered Elgar, fast becoming a stalwart champion of his music at the London music publisher Novello. Elgar’s portrayal of his loyal friend and ally as Nimrod is profoundly elegiac and noble. Yet another German, Hans Zimmer (in collaboration with Benjamin Wallfisch and Lorne Balfe) quotes fragments of Nimrod in his original film score for Christopher Nolan’s wartime epic Dunkirk. These melodic invocations, framed in contrasting modes as suspenseful augmented derivations, appear in six out of eleven sections of the soundtrack in three contrasting keys: C major, E major, and E flat major. These recurring Nimrod motives in a major motion picture about the German route of the British Expeditionary Force at Dunkirk are noteworthy for a variety of reasons. During World War II the German military issued coded messages to its forces using the Enigma machine, an elaborate rotor cipher device named after Elgar’s impenetrable Enigma Variations. Jaeger’s name is associated with Dunkirk because special units of the German Army called Panzer Jäger Battalions took part in its encirclement and capture. The first two fragments from Nimrod are quoted in the key of C, a symbolic gesture as the bulk of the British army was evacuated by sea in Operation Dynamo. Dunkirk would not be another Yorktown. The number of days that the evacuation required presents an uncanny parallel with Variation IX, for it began March 26, 1940, and concluded nine days later on June 4. Dunkirk in the original French (Dunkerque) has nine letters. There are sea fragments quoted in the Enigma Variations, and in Dunkirk’s film score there are fragments of the Enigma Variations quoted in C. In a surprising twist, the Nimrod fragments’ key letters (C major, E major, and E flat major) produce the phonetic equivalent of sea (CEE) with the c sounding like an s as in the word circle. 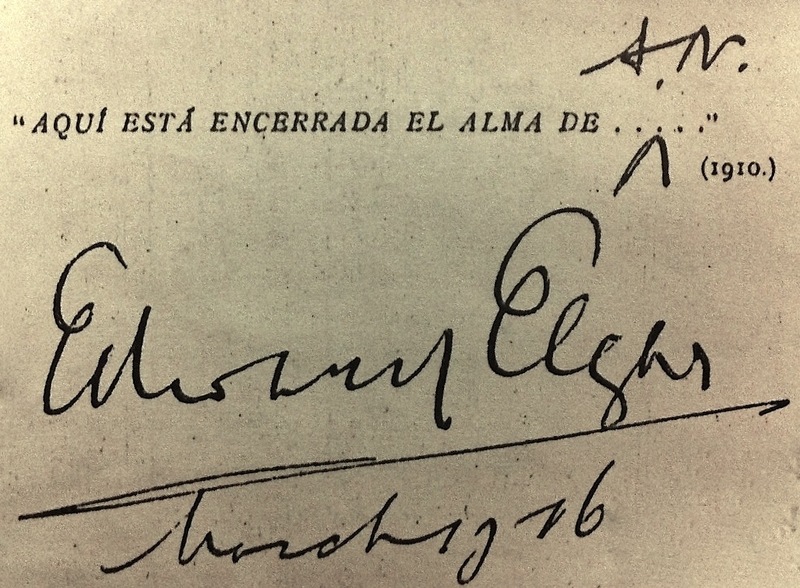 Such an outcome is doubly remarkable because Elgar’s personal correspondence bristles with phonetic spellings, and he routinely signed his letters (pun intended) with his initials (EE). The specter of death looms over the embattled shores of Nolan's Dunkirk, and so too with the Enigma Variations. The silence of the principal Theme is evocative of a passage from Psalm 37:17 that mentions the silence of the grave. For Elgar, there was an indelible link between music and death because as a boy he studied musical scores at a local churchyard while resting on a tombstone. In Variation XIII, Elgar repeatedly quotes a fragment from Mendelssohn’s concert overture Calm Sea and Prosperous Voyage (Meeresstille und glückliche Fahrt) to portray a ship crossing the open sea. This sonic symbolism was inspired by the poetry of the famed German playwright Goethe whose seemingly benign image of a boat adrift on a windless sea actually depicts the stillness of death (Todestille). 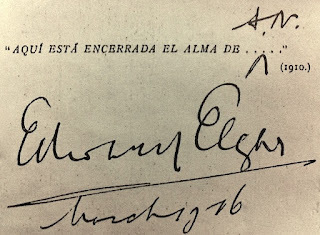 In the original program note for the 1899 premiere of the Enigma Variations, Elgar likens the absent principal Theme to the mysterious protagonist who never appears on stage in various dramas by the Belgian playwright, Maeterlinck. That absent character is death, a central element in Maeterlinck's works described as "marionette" plays as the characters rarely move. In a sense, the soldiers stranded and surrounded on the beach at Dunkirk were like marionettes waiting for the waves of little ships to launch them on an epic exodus. For some, their final destination would be the watery depths as their vessels were strafed and bombed by the Luftwaffe or torpedoed by U-boats. Fortunately for the majority of Britain's beleaguered soldiers, their safe arrival in England heralded a rebirth of the home army that would eventually mount a triumphant return to the continent on D-Day in Operation Overlord. Melodic snippets of Nimrod surface on six tracks of Nolan's Dunkirk in a torpid tempo of 6 beats per minute. This poses another remarkable parallel with the Enigma Variations because the number six serves as a numeric talisman throughout that symphonic tour de force. For example, the Opus number 36 is the product of six multiplied by itself. In Dunkirk’s score, the Nimrod fragments appear in three distinct keys over six tracks, encoding a deft reference to that opus number. The number 36 is linked to the nautical expression “deep six,” a term referring to a burial at sea at a depth of 6 fathoms or 36 feet. That opus number conveys another deathly allusion within the Enigma Variations. With overt melodic and poetic references to a ship crossing the open sea in Variation XIII, it is stunning no mainstream Elgar scholar every fathomed that numeric maritime reference. In his dedication that prefaces the Variations, Elgar wrote precisely six words, “Dedicated to my friends pictured within.” Notice the first syllable of that inscription (Dedicated) sounds like "dead," serving up yet another intimation at mortality. 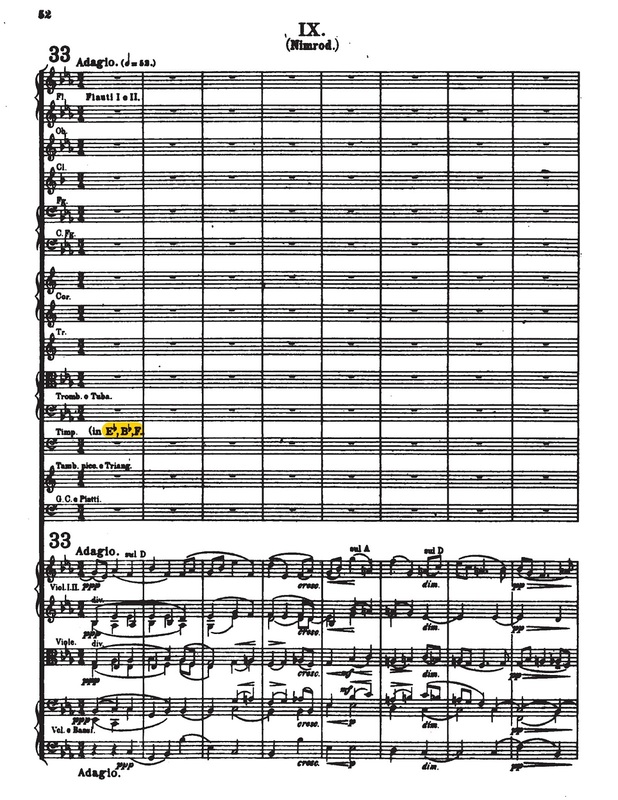 Elgar repeatedly hints at death in the Enigma Variations to serve as a subtle clue regarding the identity of the secret friend embodied in Variation XIII whose initials are hidden in plain view by the Roman numerals. There are even more coded references to the number six in the Enigma Variations. Like the name Nimrod, the Theme's unconventional title Enigma consists of six letters. In all, there are six titles in the Enigma Variations comprised of six letters each. Six of the Enigma Variations are set in G minor, a key signature with two flats (B flat and E flat) with the accidental F sharp functioning as the leading tone. In the Enigma Theme’s fifth bar, Elgar uses a conspicuous augmented chord known as a German sixth. At the end of the original Finale, Elgar wrote a six-word paraphrase of a passage from Tasso’s Gerusalemme Liberata, “Bramo assai, poco spero, nulla chieggio.” The literal translation of that Italian phrase is, “I desire much, I hope little, I ask nothing.” Goethe composed the play Torquato Tasso about that sixteenth-century Italian prince of poets. It is hardly coincidental that there is a special connection between Tasso and the secret friend portrayed in Variation XIII. Elgar draws unusual attention to the number six throughout the Enigma Variations to serve as an illuminating hint concerning the Enigma Theme's secret melody and “dark saying” cited in the original program note. Like Jaeger whose nobility is enshrined in Nimrod, the lead composer for Dunkirk’s score, Hans Zimmer, is a German residing in a predominantly English speaking country. At first glance, it seems a tinge ironic that a German would lead the team that composed the music for a wartime epic memorializing the siege and evacuation of British and allied forces at Dunkirk, a colossal military disaster unleashed by the Wehrmacht. There is another deeper German connection to the Enigma Variations hinging on its secretive principal Theme. Elgar insisted the Enigma Theme was a counterpoint to a famous melody, and mounting evidence points to Ein feste Burg (A Mighty Fortress) by Martin Luther. That hymn was a patriotic paean of the German military sung before battle and following each victory. There is a distinct military nexus between Jaeger's last name and the German military for the word Jaeger was once used to refer to the light infantry of the German army. More significant for Elgar (an ardent disciple of the German school), Ein feste Burg is quoted in the music of such German luminaries as Buxtehude, Pachelbel, Telemann, Bach, Handel, Mendelssohn, Raff, and Wagner. To follow in the footsteps of these titans without openly offending his Roman Catholic sensibilities, Elgar opted to covertly quote Luther’s battle hymn of the Reformation relying on a curiously constructed countermelody. In the process, he produced a melodic cipher that baffled and befuddled laypersons and experts alike for over a century. The recognition of Ein feste Burg as the covert Theme places a renewed significance on the number six throughout the Variations. The complete title of Luther’s hymn is six words in length: Ein feste Burg ist Unser Gott. The German augmented sixth chord in measure 5 of the Enigma Theme further hints at both the language and number of words in the covert Theme’s title. Moreover, the accidentals for the Enigma Theme’s G minor mode (B flat, E flat and F sharp) encode the initials for the shorter and more commonly used version of the title, Ein feste Burg. The Enigma Theme's key signature literally holds the key to unlocking Elgar’s melodic riddle. These same three letters turn up again for the tuning of the timpani in Variation IX as E flat, B flat and F. The timpani’s prescribed tuning for Nimrod is a transparent anagram of the covert Theme’s initials, and it occurs precisely at Rehearsal 33. That number is the mirror image of Elgar's initials of two capital cursive E's with rounded corners. With one coded set of initials at Rehearsal 33 representing his own, Elgar deftly hints at the presence of yet another set of initials in the same place within the score. In a cryptographic double entendre, the numeric equivalent of Elgar's initials unmasks his Nimrod Timpani Initials Cipher. Elgar openly hinted at the Germanic origin of the hidden Theme's title by sourcing his initials (E.D.U.) for Variation XIV from the German rendering of his first name (Eduard). 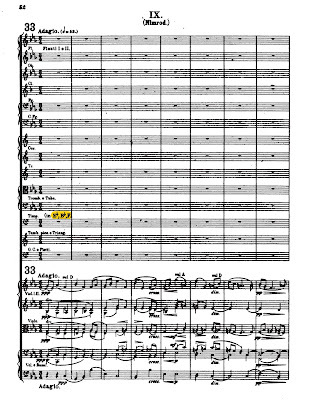 To make this point emphatically clear, Elgar even had Jaeger (his only German friend represented in the Enigma Variations) pencil in the word "Enigma" on the original orchestral score. Like its English counterpart, the word enigma is spelled identically in German. The surprising reality is the titles of the first and last movements of the Enigma Variations (Enigma and Eduard) are both in German. There is yet another German connection with the Enigma Variations, for Hans Richter, the great German conductor and Wagner protégé, directed its premiere in June 1899. As a token of his gratitude, Elgar gave Richter a copy of Longfellow's Hyperion. With that seemingly innocent gesture, Elgar literally gave away the answer because Luther's "sublime old hymn" is described by Longfellow in that romantic tome. It is remarkable the initials E.F.B. are encoded by the Mendelssohn fragments in Variation XIII. Within the opening six measures of the Enigma Theme, Elgar constructed an ingenious 6 by 6 Music Box Cipher that encodes the complete 24 letter title of the covert Theme. Contrary to the claims of mainstream scholars like Julian Rushton, Elgar left behind written confirmation of the correct melodic solution in the form of a music cipher embedded in the Enigma Theme's opening six measures. This would explain why Elgar said in the original 1899 program note that the solution to the Enigma Theme's "dark saying" must remain "unguessed." One cannot guess the solution to a cipher because it must be decrypted. On closer inspection, Elgar's odd nickname for his German friend Jaeger turns out to be an exquisite wordplay on the German title Ein feste Burg. Elgar was an avid aficionado of wordplay. The biblical description of Nimrod as “a mighty hunter” conveniently in order the first two words of that title (“a mighty”). According to the scriptural account, Nimrod was an architect and builder of fortified cities, more succinctly known as fortresses. It is not that much of an extrapolation to extract from Nimrod’s connotations the title A Mighty Fortress. Jaeger’s Germanic lineage further invites the translation of A Mighty Fortress to the original title Ein feste Burg. Elgar’s penchant for wordplay is on full but covert display with his careful selection of “Enigma” for the title of the iconic Theme, for its first three letters (Enigma) are an anagram of the absent Theme’s first word (Ein). There is yet another uncanny link between the fortuitous disaster at Dunkirk and Elgar’s phantom Theme. The initials for the British Expeditionary Force (BEF) are an anagram of the initials for Ein feste Burg (EFB). To learn more about the secrets behind one of Elgar’s most celebrated symphonic achievements, read my free eBook Elgar’s Enigmas Exposed. Great article! Thank you for bringing all of this to light for me. I loved the movie and now I am going to have to watch it again with this article beside me. What an interesting article. As a musician and having listened many times to Elgar's Nimrod variation for pure pleasure, I was taken aback while watching the movie Dunkirk recently in a movie theater in Paraguay ...to hear the strains of Elgar's music used by Hans Zimmer! At one of the most moving / uplifting scenes we hear it clearly albeit at a much slower tempo ....so that it stretches out to cover the long scene. I had no idea however, how much a connection there was between Elgar's Enigma Variations and this movie. Thanks for bringing it all to light for us! Also I learned a lot more about Elgar and his fondness for enigmatic musical themes and the ties to other works of art. Thank you for the article - it was an interesting read. I found your article because of a letter I just read. The letter was written by DORA M POWELL. As a watch collector I regularly trawl through auction sites looking for bargains and came across the letter by accident. I don't know if Ms POWELL is famous - the letter is expected to sell for between £1 and £30 - not a great deal.